Bryan Adams was born Nov. 5, 1959, in Kingston, Ont., and lived in Portugal, Israel and Austria before settling in Vancouver with his mother and younger brother Bruce after his parents' divorce. 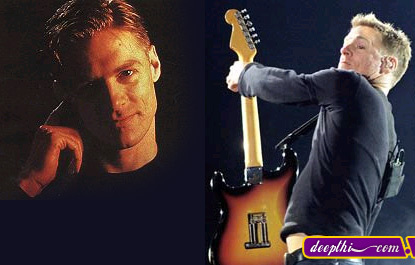 With his sandy vocals and blue-collar songwriting skills, crafty Canadian hitmaker Bryan Adams' pop-friendly take on rock 'n' roll basics found a niche that lasted through much of the 1980s and into the early '90s. Just about anyone who turned on a radio during those years will remember songs like "Cuts Like a Knife," "Summer of '69," and "Run to You." He remains active today, working the ballad territory that yielded the 1991 mega-hit "(Everything I Do) I Do It for You." At 12 he could already play piano and at 16 he quit school to pursue a musical career full time and even ended up singing in a later version of Vancouver band Sweeney Todd. At 17 he met songwriter Jim Vallance, and the pair became a songwriting team before Adams signed with A&M Records in 1978. He had a minor disco-tinged hit with Let Me Take You Dancing in 1979, his solo debut album didn't do all that well, but his You Want It You Got It LP led to opening slots for the likes of The Kinks. Cuts Like a Knife was Adams' breakthrough recording -- earning him his first Top 40 hits in the States with Straight From the Heart, the title track and This Time. Reckless, in 1984, earned Adams No. 1 album status and yielded the hits Run to You, Heaven and Summer of '69. With 1987's Into the Fire, Adams became the most successful Canadian recording artist and was named Artist of the Decade by the Canadian Recording Industry Association in 1990. After all that, 1991's Waking Up the Neighbours was Adams' biggest success, largely on the basis of the single (Everything I Do) I Do It for You, a tune written for the film Robin Hood: Prince of Thieves, which hit No. 1 in 30 countries. This success was followed up by two other worldwide chart-toppers from movies, All for Love from The Three Musketeers and Have You Every Really Loved a Woman, from the Don Juan DeMarco soundtrack. 1996's 18 Til I Die unveiled a slick new look for Bryan and yielded hits in the title cut and The Only Thing That Looks Good on Me is You. In 1998, he released On a Day Like Today, which became a hit on the basis of the songs When You're Gone, a duet with Mel C. of Spice Girls fame, and Cloud Number Nine. Last year saw the release of The Best of Me, Adams' second greatest hits package, and this year sees him welcoming a new century with a six-month world tour.